Language Kiswahili or Swahili (official); English (official); Arabic (official in Zanzibar); many local languages. 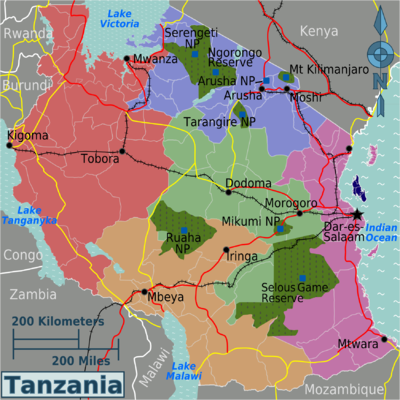 Tanzania  is the largest country in East Africa, bordered by Kenya and Uganda to the north; Rwanda, Burundi, and the Democratic Republic of the Congo to the west, and Zambia, Malawi, and Mozambique to the south. This is one of the oldest known continuously inhabited areas on Earth; fossil remains of humans and pre-human hominids have been found dating back over two million years. Tanzania is believed to have been populated by hunter-gatherer communities, probably Cushitic and Khoisan speaking people. About 2000 years ago, it is believed that Bantu-speaking people began to arrive from western Africa in a series of migrations. Later, Nilotic pastoralists arrived, and continued to immigrate into the area through to the 18th century. Travelers and merchants from the Persian Gulf and Western India have visited the East African coast since early in the first millennium CE. Islam was practised on the Swahili coast as early as the eighth or ninth century CE. In the late 19th century, Imperial Germany conquered the regions that are now Tanzania (minus Zanzibar), Rwanda, and Burundi, and incorporated them into German East Africa. The post-World War I accords and the League of Nations charter designated the area a British Mandate, except for a small area in the northwest, which was ceded to Belgium and later became Rwanda and Burundi. British rule came to an end in 1961 after a relatively peaceful transition to independence. In 1954, Julius Nyerere transformed an organization into the politically oriented Tanganyika African National Union (TANU). Nyerere became Minister of British-administered Tanganyika in 1960 and continued as Prime Minister when Tanganyika became officially independent in 1961. After the Zanzibar Revolution overthrew the Arab dynasty in neighboring Zanzibar, which had become independent in 1963, the island merged with mainland Tanganyika to form the nation of Tanzania on 26 April 1964. From the late 1970s, Tanzania's economy took a turn for the worse. Tanzania aligned with China, seeking Chinese aid. The Chinese were quick to comply, but with the condition that all projects be completed by imported Chinese labor. From the mid 1980s, the regime financed itself by borrowing from the International Monetary Fund and underwent some reforms. From the mid 1980s Tanzania's GDP per capita has grown and poverty has been reduced. January to February: This is the best time to visit the Serengeti. It is usually at this time that huge herds of wildebeest, zebra and buffalo migrate to better grazing areas. You could observe some of the 1.5 million wildebeest that inhabit the Serengeti undertake their epic journey. Be advised this is most likely the hottest time of year in Tanzania, when even the locals complain about the heat. You've been warned! Arusha National Park - Home to the 5th highest peak in Africa, Mt. Meru (4,500m). You can climb it independently. Mahale Mountains National Park - See Chimpanzees up close and experience the clear water of Lake Tanganyika. No visa is required for stays of less than 3 months for citizens of Namibia, Romania, Rwanda, Hong Kong, Malaysia, Macau and all commonwealth member states (except the United Kingdom, Australia, Canada, Bangladesh, New Zealand, Nigeria, India & South Africa). A Tourist Visa costs US$50 or US$100 for a three-month single entry and a three-month double entry visa, respectively. The visa can be obtained upon landing in Dar es Salaam, Kilimanjaro, Mwanza and ports of entry. Be advised that the wait can be especially long if your flight arrives at the same time with other international flights. Obtaining a visa before arrival is recommended. Holders of a US passport can only obtain a US$100 multiple-entry visa. The website of Tanzania Embassy in the U.S. gives the current requirements, . KLM Royal Dutch Airlines  (Amsterdam), +255 22 213 9790 (Dar) & +255 27 223 8355 (Arusha). Daily flights with stopover in Kilimanjaro. British Airways  (London-Heathrow), +255 22 211 3820. Flights on Tuesday, Friday and Sunday. Swiss International Air Lines  (Zurich), +255 22 211 8870. 5 flights a week (Monday, Wednesday, Thursday, Friday and Saturday) with a stopover in Nairobi, Kenya. Turkish Airlines  from İstanbul to Dar Es Salaam directly, from İstanbul to Kilimanjaro directly. Emirates  (Dubai), +255 22 211 6100. Daily flights. Qatar Airways  (Doha), +255 22 284 2675, 1019, Julius Nyerere International Airport, Dar es Salaam, Tanzania. Daily flights. Air India  (Mumbai), +255 22 215 2642. Flights on Monday, Wednesday and Friday. South African Airways  (Johannesburg), +255 22 211 7044. Twice daily flights. Ethiopian Airlines  (Addis Ababa), +255 22 211 7063. Daily flights (except for Monday) with a stopover in Kilimanjaro. Egypt Air  (Cairo), +255 2 136665. Daily flights. Air Tanzania , +255 22 211 8411, [email protected]. air viva, offering domestic flights and flights to Kenya. [email protected]. Precision Air , +255 22 212 1718, Along Nyerere/Pugu Road, P.O Box 70770, Dar es Salaam, Tanzania, [email protected] or [email protected] also flights to/from Kenya. Coastal Aviation , +255 22 211 7959, P. O. Box 3052, 107 Upanga Road, Dar es Salaam, Tanzania, [email protected]. Auric Air , +255 783 233 334, P. O. Box 336, T-14 First Floor, Haidary Plaza, Upanga/Kisutu street, Dar es Salaam, Tanzania, [email protected]. provides daily service to all major cities, including Zanzibar Serengeti Arusha and most national parks. ZanAir , +255 24 223 3670, P.O.Box 2113, Zanzibar, Tanzania, [email protected]. If you're hiring a car when you get here, your best option is a 4x4 sport utility vehicle with good road clearance, especially if you plan on going on safari in any of the national parks. Look for the Land Cruiser, Hilux Surf (4Runner), and Range Rover vehicles. Avoid mini-SUVs, such as the Toyota RAV4 and Honda CRV, because they can't always negotiate the poor road conditions in most of Tanzania's national parks. Another issue is 4-wheel drive options. Low-slung cars are not a good choice despite having 4-wheel drive. These vehicles were designed for driving in the snow on paved roads or through small mud holes. What you encounter in national parks in Tanzania is quite different and demands a proper 4-wheel drive vehicle capable of traversing large mud holes and sandy roads. Even then, you may still get stuck. Nelles Maps of Tanzania, Rwanda & Burundi  is the best map. They've taken the time to locate the smallest of villages along the routes, which is great for navigating places where landmarks are scarce. The bus is a great way to get into Tanzania. Fly to a place like Nairobi, then you can catch a bus down to Arusha, a great base for Mount Meru and Ngorongoro Crater. Also, you should not forget the south central part of Tanzania, away from tourist hawkers. Roads in Tanzania aren't in good condition; there are no highways, and there are very few multiple lane segments along main roads. Buses slow down or stop in most villages because of traffic, police, and speed calming tools. For your reference, the trip from Dar to Iringa takes at least 6 hours in a private vehicle. It's mostly a two-lane road, recently rebuilt by the Chinese, so it's in good condition for the most part. Azam Marine and Fast Ferries connect Dar es salaam and Zanzibar. And it's about 90 minutes sail. The bus is the most common way to travel around in Tanzania. Most buses have a simple design, and the roads are poor, although 1st class air-con buses are available on the Dar-Moshi-Arusha route (Dar Express - ticket office on Libya Street downtown or office no. 45 at Ubungo). Nearly all buses go in and out of Dar es Salaam. The main bus station in Dar (where all buses go), Ubungo, is 8 km west of the city center. A number of the better "intercity buses" provide you with complimentary drinks and biscuits. In Dar, minibuses called Dala-Dalas can be taken cheaply to most places within the city. The fare is written on the front next to the door - currently it's usually TSH 250 for adults (2011) except for longer distances. The route of the bus is also stenciled on the front and sides of the bus, e.g. 'Posta-Mwenge' and there's a colour coding system. Posta (outside the central post office on Azikiwe/Maktaba Street) is the main downtown daladala hub. Others are Kariakoo, Mwenge, Buguruni, Ubungo etc. Hop on the daladala, take a seat if there is one, and pay the conductor ('konda') when he shakes his pile of coins at you in a meaningful way. The konda shouts the names of the stops - if you don't know where you are, or don't know the name of your destination stop, it'll be hard to know where to get off. If possible, it's worth asking someone at your destination, since the stops sometimes have no signs at all - people 'just know' that certain street corners are the daladala stop and the names are not obvious (e.g. 'Sudani' on the Masaki-Posta line - near the Sudanese ambassador's residence on Toure Drive). When you hear/see your stop and want to get off, shout 'Shusha!' (let me off), the konda will knock on the chassis twice, and the driver will immediately swerve to the side and stop. The daladalas don't run very late; on the east side of town the latest ones are the Msasani and Mwenge routes. There are also three-wheeled tuktuks/baby taxis/CNGs/bajajis that zoom around. They are cheaper than a taxi, and can get past traffic jams. Probably not the safest option but I haven't heard of any bajaji-related problems. You can negotiate the fare in advance, but sometimes the driver doesn't know your destination 8there's no Dar es Salaam 'knowledge') and won't know how much to charge. The drivers I've taken have generally quoted pretty fair prices (maybe with a reasonable 'skin tax' for white people) at the destination and if they're trying to rip you off you can usually tell by the leer. It may be handy to know 'right' and 'left' in Swahili: kulia (right), kushoto (left), moja kwa moja (straight), simama (stop), asante kaka (thanks brother). There are several local Tour Operators which have fleet of cars for hire in major airports like Dar es Salaam Julius Nyerere Airport, Kilimanjaro International Airport, major cities and all towns which are peripheral to tourist destinations like Moshi, Mwanza, Arusha, and Karatu around Ngorongoro. Safari While you are in Tanzania you may organize your safari to Serengeti and other National parks at an affordable price. If there's one trip that will change your perspective on life, it's an African safari. Contact some of the tour operators for Safari Details. Cultural Tours Touring Tanzania for culture is interestingly great as it encompasses more than 150+ ethnic groups. There is plenty of traditional food, cultural practices (such as hunting with bushmen, beekeeping, traditional medicine) that one enjoys within the boundaries. You will also get to visit a number of locations that normally people would be completely unaware of. If you happen to be a person who loves to explore the world and meet new people in order to gain knowledge about different customs, a cultural tour is definitely the best type of vacation for you.The services are not expensive and can turn out to be cheaper than expected provided you get the right information on where to stay, best tour companies and just knowledge of what you want. This way, it will save you time and costs as well. Tanzania has two of the best Stone Age sites in the world: Isimila Gorge (near Iringa) and the earliest known examples of human art among the rock paintings, near Kolo, north of Dodoma -- some of which are reckoned to be around 30,000 years old. Camping safaris Tanzania: Camping safari is accommodation option preferred by colonialists during Medieval time because at that time Lodges and Hotels were not well developed. Adventure people traveled across the world to discover major Geographical features in Africa like Mount Kilimanjaro, Great Rift valley, Ngorongoro crater and more used tented camps. Camping safari uses tents as a shelter for outdoor travel and wilderness research. Nowadays camping safari is used as accommodation for wildlife safaris in Tanzania and Africa at Large. There are types of camping safaris such as luxury tented camps, mobile camping safaris and budget camping safaris. Budget camping safari is also known as basic tented camps and low cost safaris Tanzania. Budget camping safari is cheap wildlife safari trips and adventure tours in Africa. To see places you need to Move, Car hire is a deal. Car hire in Tanzania will help you move from one place to another for sight seeing tours or wildlife tours. Several car hire agencies offer car rental for varies purposes. You can rent car for Town sight seeing or game park safaris. Price The cost of a safari can range from the basics (fly-tents, self-catering and guides with vehicles) to smaller parks like Manyara and Tarangire, to luxury lodges and tented camps in the Serengeti which can cost anywhere from US$250 to US$1,500 per person per night. You can use your own vehicle, provided it's a 4x4 with adequate clearance. There is a benefit to hiring a guide and a vehicle as safari vehicles are equipped with open rooftops which provide a much better vantage point for animal viewing. Also, many park will require that you hire a certified guide before you enter the park, even if you're using your own vehicle. Guides can cost around US$35 a day plus tip. Guides are good to have since they know the park and can help you locate some of the more sought after animals such as lions, leopards, rhinos, cheetahs and hyenas. This is basic camping safari where tourists visit national parks and game reserves and the accommodation is on budget tented camps. Budget camping safari differ from one Tour Operator to another. For Kilimanjaro Travel Adventure Safaris Co.Ltd budget camping safaris is organized in different way as explained below. Tourists travel in 4WD Landcruisers or Landrover safari car together with cook and driver guide. Camping equipments, cooking materials, water and food will be in same car. On Arrival at Camp ground means cook, TENT CREW and driver guide will start erecting tented for tourists. Camp grounds in National parks are usually at Public campsites. Public campsites have kitchen, bathroom and toilet. Public campsites are usually for shared for all travelers there especially budget camping safari. The cook and camp crew will prepare food and warm water for bathing. Tourists will sleep on mattress on ground, mattresses, bedsheets and blankets will be provided. Tourists are advised to bring sleeping bags. Budget camping safaris is comfort, enjoyable and bring tourists close to nature experiencing real wildlife safari in the wilderness of African bush. Park fees for Manyara and Tarangire for 2015 US$45 per person and US$10,- for vehicle/driver fees. For Ngorongoro there is a US$200 vehicle fee as well, a $50 per person park fee as well as a $10,- vehicle/driver fee. For the Serengeti it's US$60 per person with and a $10,- vehicle/driver fee. These fees are valid for 24 hours. If you arrive in the afternoon, you can return in the morning the next day and not pay again. Bongoyo Island is easy to get to with a boat from slip way. It is has a remarkable beach with excellent snorkeling in clear water, although you may be better off taking your own snorkels as renting is costly. The island is not tide dependent therefore you can swim at any time. There is a residence price and a 'muzungu' price' but still quite reasonable. Mount Kilimanjaro is the highest peak in Africa and one of the highest freestanding mountains in the world. 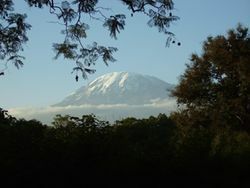 Many people travel to Tanzania just to climb this mountain. Does tend to be crowded with tourists. You can either organize your trek up the mountain from your home country through a travel agency, but you'll pay a lot more for this convenience, or, if you've got a bit of time, hop on plane and save some money by organizing it in Arusha, Moshi or in Dar. Be advised that there are as many incompetent and dishonest trek organizers as there are good ones. Ask around to make sure your guide will deliver on his promises. Mount Kilimanjaro importance increased recently after entering to 7 natural wonders Africa competition in August 2012 among 12 natural attractions in Africa. In February 2013, Mount kilimanjaro was announced as one of 7 natural wonders Africa and hence pinnacle of Africa. [Mount Meru] Second highest mountain in Tanzania (4562m)is located in the center of Arusha National Park, a beautiful area with a wide range of habitats teeming with wildlife. On the lower slopes of the mountain and inside the park, there is a good chance of spotting animals. An armed ranger will accompany your party on the first stage to protect against any wildlife threats. The trail follows the north rim of the crater, along a dramatic ridge line. Once at the summit, the views of Mount Kilimanjaro and down into Meru crater are unforgettable. Many people who climb both mountains have a quiet preference for the humble Mount Meru. The predominant official language and lingua franca is Swahili, which is spoken by over 90% of the population. English has some official status - it is used in foreign trade, diplomacy, the higher courts, and as a medium of instruction in secondary and higher education, although the Tanzanian government plans to discontinue English as a language of instruction altogether. Arabic is widely spoken and is official at Zanzibar. Many languages are spoken at the local level. Most Tanzanians learn their local tribal language first. Then, in primary school, they learn Swahili. When they go to secondary school, they are taught English. As elsewhere, English is more commonly spoken in larger cities and tourist destinations. Since sunrise and sunset happen pretty much at the same time all year round, 6a.m. and 6p.m., the day starts at 6a.m.which is 0 hours. So when telling time in Kiswahili, Tanzanians always subtracted 6 hours for western time. 11 a.m. is 5a.m to a Tanzanian. To avoid any confusion, a Tanzanian will tell time in English if they want to use the western standard and in Kiswahili if they use local standard. If you want to practice your Kiswahili, just keep this in mind if you discuss appointment times with a Tanzanian. If you say Saa tano asubuhi (11 a.m.), instead of Saa kumi na moja asubuhi(5 a.m.), you'll end up waiting for 6 h if the person arrives on time, plus however long it takes to arrive fashionably late! Coins - 500, 200, 100, and 50 denominations. In Jan 2019, one US dollar was worth about 2300 Tsh. Note that Tanzanian currency exchangers usually have a different exchange rate for different US$ denominations, larger and newer bills having a better exchange rate than older and smaller bills. The difference in exchange rate between $1/$5 bills and $50/$100 bills may exceed ten percent. Older US $100 notes are no longer accepted in Tanzania, and any note older than 2003 will most likely be refused everywhere. Also, it's best to avoid attempting to exchange notes with pen marks or any writing on them. Finally, be advised that if you withdraw a large amount of money, in the range of $400 US, you'll have to carry over 40 notes around! In general, stores, restaurants, and hotels in Tanzania expect payment in Tsh. Exceptions include payment for travel visas, entry fees to national parks (which must be paid in US dollars by non-residents), and payments for safaris and Kilimanjaro treks, which are generally priced in US dollars (though payment will be also accepted in other currencies). On Zanzibar, prices are generally in US dollars (including the ferry fare from Dar es Salaam to Zanzibar), and non-residents are required to pay for hotels with foreign currency (although the hotel will change Tsh for you). Make sure your US currency is current--US dollars older than 2001 will not accepted by most places in East Africa. Most hotels will exchange US dollars, Euros and British Pounds for Tanzanian Shillings. Other currencies, such as Canadian or Australian dollars, may be accepted but at rates far below the going rate. ATMs are mostly located in the city center and on the Msasani Peninsula. For those wishing to withdraw money from bank accounts back home, in general, Barclay's, Standard Charter, "'Exim"', CRDB and NBC ATMs work with PLUS and Cirrus compatible cards. Additionally, if you have a PIN code for your credit card, almost all Tanzanian banks with ATMs will allow cash advances on credit cards like Visa, Mastercard, and American Express. If the ATM reports your home balance in TSh, you may be pleasantly surprised to find that you're a "shillionaire". Produce is often of very poor quality. Meat and milk can prove difficult for western taste and diets, so be sure that all meat is cooked through. At hotels, you won't have any trouble, but if you venture into small villages, make sure that all water is filtered or boiled before drinking and all fruits and vegetables are peeled before eating. Bottled water is cheap and widely available throughout the country. You shouldn't drink the tap water unless you have no other option, and it must either be filtered with a high quality filter and purifier or kept at a rolling boil for at least 10 minutes before consumption. Recent tests on tap water have found it contaminated with the e-coli bacteria. Domestic beers are Kilimanjaro, Serengeti and Safari, which are western-style and very good. Imports include Tusker, Stella Artois, and Castle. Tanzania is home to some of the most exotic drinks in the world. Be sure to avoid touts. If you are travelling as a couple, a good idea is for one person to sit in a lobby or restaurant with the bags, while the other scopes out rooms. You are likely to get a cheaper price without the bags, and not be targeted by sneaky touts that will raise the price $5-$10 for you for their commission. There is a wide assortment of volunteer organisations sending volunteers and interns to Tanzania to do work in health care, orphanages, education, and development projects. On Volunteer World, a social startup from Germany, . , you can search and compare all volunteering options in Tanzania online and get in direct contact with the NGOs of your choice. edit Finding a paying job may be more of a daunting task, taking more time and making use of local connections, but a job could be certainly obtainable when sought hard enough. Caution should always be exercised, particularly in tourist areas, such as Arusha, Stone Town (Zanzibar), and Dar es Salaam. Violent crime against foreigners is not uncommon, particularly against those walking alone at night, which is not recommended. Pickpocketing and con artists are also common. Pickpockets work crowded markets, like Kariakoo, and bus stations. Don't be fooled by small children who are often forced into a life of crime by older kids or parents -- never carry anything of value in your pockets and don't let expensive camera equipment dangle from your neck. Don't leave bags unattended or even out of your sight when on the beach. The safest way to travel is by taxi with a driver you know, especially when it's dark out (late night or early morning). Although it's uncommon, taxi drivers have been known to rob tourists. Taxi drivers are a major security weak link in Dar es Salaam. Get the number for a taxi you trust, from your hotel or a local. If you are in a situation where you have to take a taxi that has not been recommended, take the number and send it to your relative so that it can be tracked if something happens. Most of the taxi drivers in Dar know the criminals who hang out in their parking area but turn a blind eye to their activities. Walking safaris is a part of Ecotourism whereby tourists walk to see natural scenery of tourist destinations to minimize impacts on tourist destinations. Ecotourism is travel to natural places which are virgin while conserving environment and improving well being of people. Ecotourism activities include walking safaris, game drives, bird watching, trekking, cultural tourism and mountain climbing. Ecotourism is a responsible travel whereby all tourist destinations visited are left intact and ecotourism is guided by naturalist guides. Naturalist guides include safari guides and mountain climbing guides. In Tanzania ecotourism hotspots are Mount Kilimanjaro, Serengeti national park, Ngorongoro conservation area, Selous game reserve, Ruaha national park, Udzungwa and Mafia Island. To organize ecotourism trips, local tour operators know better places and private Tanzania tours. KILIMANJARO TANZANITE SAFARIS Co.Ltd offer best travel deals on climbing mount Kilimanjaro, wildlife safaris, photographic safaris, nature safaris, camping safaris, eco lodges, cheap travel packages, budget camping safaris and beach holidays. <a rel="nofollow" class="external autonumber" href="http://www.kili-tanzanitesafaris.com/"></a> Mount Kilimanjaro climbing trips, wildlife safaris, African safaris, Kilimanjaro trekking expeditions, Kilimanjaro climbing routes, machame route, Rongai route, budget camping safaris and photographic safaris Tanzania. Tanzania, like many developing countries, suffers from corruption. Police are poorly paid - many make less than $40/month. You may be solicited for a bribe by an official willing to turn a blind eye to your infraction, fabricated or otherwise. Some travellers are very much averse to paying bribes to anyone, especially in a country with so many needy but honest citizens. Yellow fever is an acute viral disease transmitted through the bite of a particular mosquito. Although not as common as malaria, it is nonetheless a serious disease, and travelers to Africa should consult a physician about being vaccinated against it. If you plan on traveling to other countries after your stay in Tanzania, be advised that some countries, such as South Africa, may require proof that you’ve been vaccinated against Yellow Fever before allowing you to enter the country. If you aren’t or can’t prove it, you will be offered two options: 1) receive the Yellow Fever vaccination at the airport, and 2) immediately leave the country. The Yellow Fever vaccine (as any cavvine) can have side effects for some people, so you may wish to get the vaccine in your home country, under controlled conditions. Most physicians will not administer the Yellow Fever vaccine to children under the age of 1 year, and a letter from a physician explaining this will ensure that your infant child will not receive the vaccine at the airport. - People travelling to Tanzania from INDIA, There is acute shortage of the yellow fever vaccine in India so please get yourself vaccinated at the airport in Dar-ES-Salaam as soon as you land there. Tanzanians will also comment if you are doing any work while they are not, with the phrase "pole kwa kazi". It literally means "I'm sorry you have to work". A simple "asante", or "thanks", will suffice in reply. Using a mobile phone If you have an "unlocked" GSM 900/1800mhz frequency mobile phone (the same frequency as used in the rest of the world, apart from USA and Canada), you can purchase a local SIM card for 500 Tsh from a series of Tanzanian service providers. The most popular are Celtel , Vodacom , and Tigo . Zantel  is a new arrival on the mainland and, through the national roaming agreement with Vodacom, currently has the largest network coverage. International telecommunications have low capacity, and can be unreliable. Some mobile providers have started offering wireless internet service. Zantel, Vodacom, and Zain are the main providers. All urban areas and many rural areas that have mobile phone coverage also have mobile internet coverage. Wireless 3G coverage is available in many areas of Dar es Salaam, Arusha, and Zanzibar town. For the Zanzibar Archipelago Zantel seems to be the best option. On the continent there is more competition between the operators. Airtime is obtained using scratch cards just like mobile phones. Connection rates are dropping dramatically and there are packages of "unlimited" access for some period of time. For example, Zantel offers 3 days of unlimited transfer for 5000 TSh.